With reference to the Ministy’s Office Memorandums 1. No. S. 11045/36/2012/GHSHEC dated 10.12.2014, 2. S.11035/36/2012-CGHS(HEC) dated 16.10.2015, 3. 11011/28/2017-CGHS (HEC) dated 16.05.2017 vide which the continous Empanelment Scheme for private hospitals and Diagonostic Center under CGHS was revived with a view to empanel more such facilities for the CGHS beneficiaries and also for newly established CGHS Center i.e. Indore. Accordingly after following due process a list of private hospital & Eye Care Center have been finalized as per the terms and conditions laid down. 1. 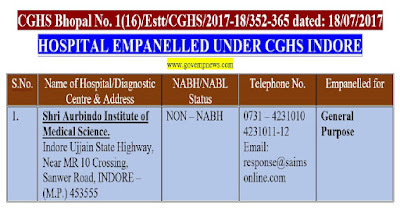 The Hospital mentioned below are empanlled for a period of Six months provisionally from the date of issue of this office memorandum or till next new empanelment which ever is earlier with the condition to rectify its deficiency within stipulated time period for continuation of its CGHS empanelment. 2. 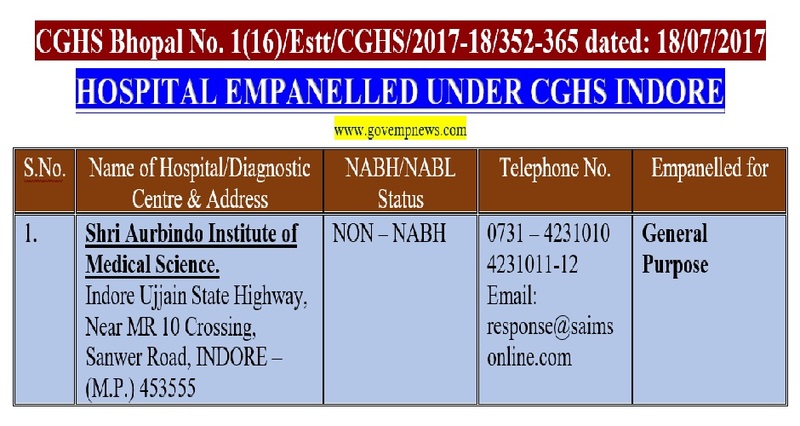 If a particular health care organization is not recommendation by NABH/NABL/QCI as the case may be for all available facilities in it, preferably within six months but not later than one year of its empanelment then its name shall be removed from CGHS panel and 50% of PEG shall be forfeited. 3. This office memorandum and the rates applicable under CGHS Bhopal for hospitals, Diagnostic Centers including eye centers can be downloaded from the website of CGHS. 4. This office memorandum is issued in pursuance of delegation of power for empanlment of private hospitals vide O.M. referred above at S.No. 3. 1. Shri Aurbindo Institute of Medical Science.